HUBLERSBURG, Pa. — It’s just after 6 a.m. on Nov. 26 in central Pennsylvania. A slight haze rolls in as light brings the forest to life more and more with each passing minute. At 6:49 on the dot _ BANG! _ a gunshot echoes through the mountains, a sure sign the first day of deer season is underway. With more than 20 hunters per square mile and more than 900,000 total hunters, the most of any state, Pennsylvania hunters are among those trying to revitalize a tradition that’s been in slow decline for some time. A 2016 U.S. Fish and Wildlife Service survey, the latest available, shows that participation is down to less than 5 percent of Americans 16 years old and older, nearly a 3 percent decrease from 1991. So who is out there? Up before dawn, wearing blaze orange and tromping through the countryside in cold weather? Some who have been coming out for years, and others who are just picking up the sport, including a growing number of women. Vaughn Holderman, a 26-year-old hunter who owns his own fishing lure business, sits about 15 feet up in a tree stand, constantly scanning from left to right. With any slight rustle of leaves his ears perk up and head turns in that direction. For Holderman, like thousands of other Pennsylvanians, the first day of buck season is an annual tradition, and he has been taking part since he was 12. It all began by a stream, just a short walk from his childhood home. On the same property where he grew up, and where his parents still live today, Holderman got his first kill, a turkey, and his first doe. In West Virginia at the age of 12, he got his first buck, and in all three instances, his father was with him. 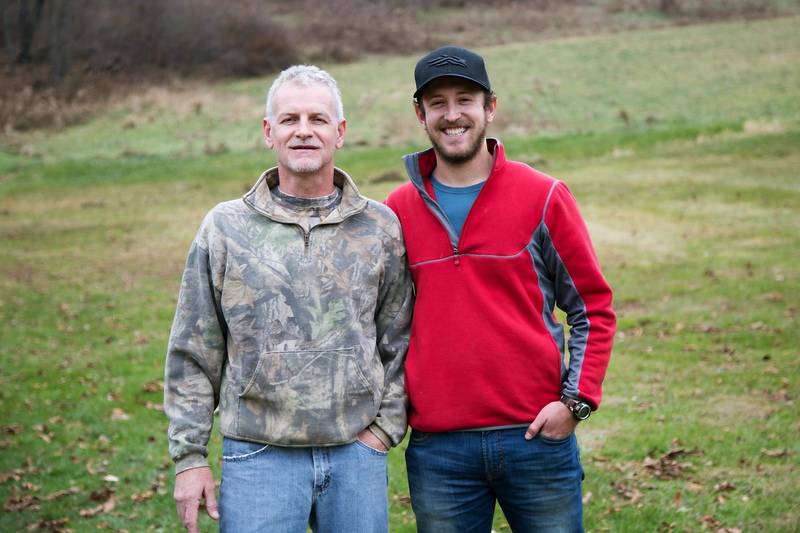 On this dreary and wet late autumn day, Holderman is not with his dad, but he joins a friend, Jason Walizer, on the Walizer family tree farm in Hublersburg, about 25 minutes east of State College. Jason’s dad, who everybody calls Denny, and 84-year-old grandfather, Jim, are out as well. Just before 6 a.m. Denny and Jim made their way to a shanty, while Jason Walizer guided Holderman to another part of the property. Just like Holderman, family is everything to 25-year-old Jason, especially his grandfather. “He’s one of the most important people in my life,” Walizer said. “Last year, he killed a buck, and it was the first buck I ever watched my grandad kill. And I chased that deer out to him on a drive and I could see from a couple hundred yards away that deer running up to him before he shot it. This year, though, it was Jason Walizer who got the buck. Around lunch time, while walking to meet up with his grandfather, he spotted what looked like a deer tail bent over. Walizer scoped it, and saw a doe. 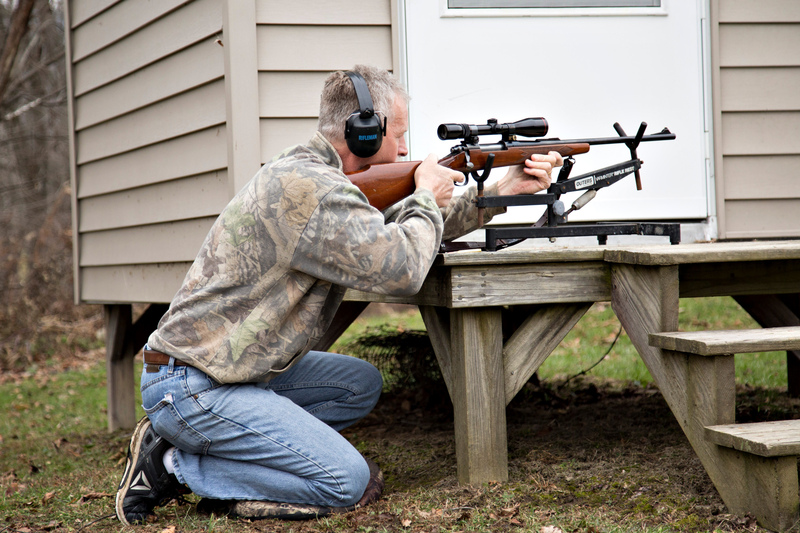 Holding his aim, he then spotted a seven-point buck and took his shot. Even as the overall number of hunters declines across the country, one subgroup is growing — women hunters. According to the National Shooting Sports Foundation, the number of female hunters grew from 1.8 million in 2001 to 3.3 million in 2013, the latest year for which such numbers are available, and the second-leading reason women cited for owning a firearm was to learn how to hunt. The Wyoming Game and Fish Department cited more than a 32 percent jump in female hunters, from 11,189 in 2008 to 14,770 in 2016, while the number of male hunter numbers stayed relatively stable. Jess Johnson, a Lander, Wyoming, resident is one of the over 14,000. Johnson, a 29-year-old public lands coordinator for the Wyoming Wildlife Federation, is a co-founder of Artemis, a non-profit organization that focuses on female hunters as well as conservation and wildlife management. Johnson, a bowhunter, also is one of many hunters who didn’t grow up around the tradition. The only child of ranchers, Johnson says hunting was in her world but it was never directly a part of her family. She didn’t use a bow until her boyfriend introduced her to the sport nine years ago. Nicole Qualtieri, a 34-year-old from Montana, also picked up the sport as an adult. Qualtieri grew up in Ohio, then moved to Colorado in high school and played soccer and rode horses competitively growing up. After a move to Montana six years ago, Qualtieri fell in love with backpacking. While trekking 150 miles solo along the Continental Divide Trail, Qualtieri came to a realization. Then, by chance in December 2014, she landed a social media job with the Netflix show “Meat Eater,” which sent her full tilt into the sport. For Qualtieri, like many new hunters, knowing where your meat comes from is a huge factor in why she hunts. Hunters, whether raised in tradition, or trained later in life, share many common traits. Just about all of them can tell you the story of the first animal that they killed, especially the first deer. For some, like Walizer and Holderman it’s a story about childhood and family. For others, it took more time. Johnson, being a bowhunter, trained for more than a year before feeling confident she could kill an animal without causing it to suffer. Qualtieri considers her first deer the first one that she took solo. For Holderman, Walizer, Johnson and Qualtieri there are two other important connections. The first is a deep respect and admiration for the animals they hunt. The second is what might save the sport of hunting in the long run — a willingness to help teach new hunters and accept them into the group. Back in the dreary forest in central Pennsylvania the day is wrapping up as light starts to fade. Walizer points to a Chinese chestnut tree nut cracked open on the ground. They planted the trees specifically to attract and feed deer on the property. "So when you have new hunters come into the spectrum. It's an opportunity to introduce what we grew up with and with what we've grown to love like the solitude and seeing the sun rise and seeing creation work," Holderman said. As Walizer and Holderman walk out of the forest side-by-side they share stories of past hunts and brainstorm hunts to come. Another first day has come and gone, but the tradition is far from ending.